Looking for the best in fine art? You have found an example here. 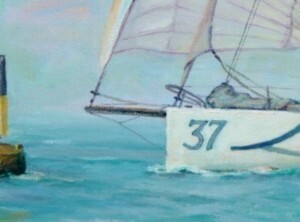 Cutlass 40 class, the painting, commissioned, measures 40 x 51 cm (16″x 20″). 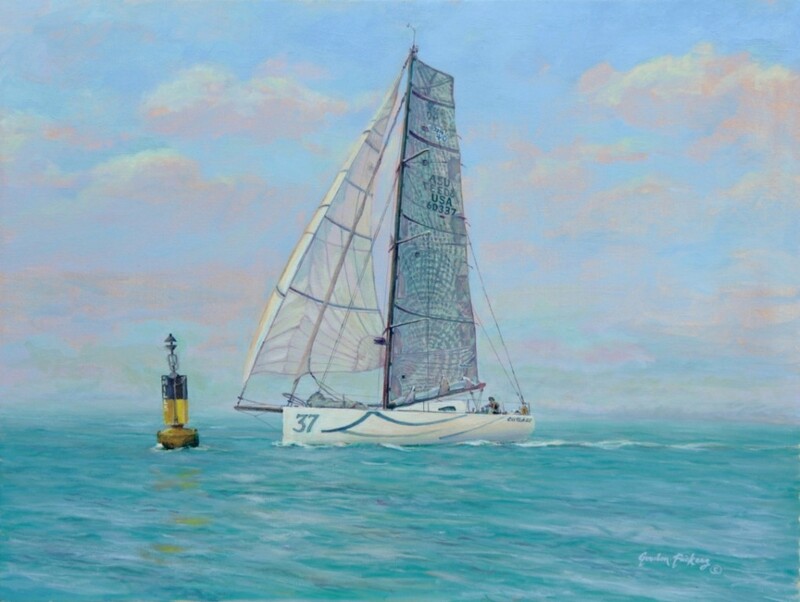 The painting “Merhan Cutlass 40 Bermuda 1-2 finish at Mills Breaker Buoy” oils on canvas 40 x 51 cms (16″x 20″) was enthusiastically received at its new home in California. 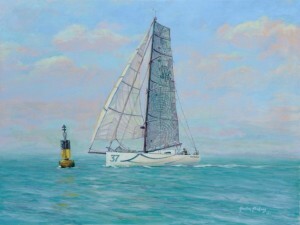 Gordon Frickers client wrote: ““Gordon – The painting is here and it looks magnificent! Thank you so much. When I get it hung I will send you a photo of it hanging“. In his initial inquiry back in 2009 my client generously wrote “I admire Mr. Frickers’ work greatly“. Now I hope you will agree he has a fine example. You too dear reader can grasp the opportunity to own a painting or drawing of this quality from this artist. How “Cutlass 40 Bermuda 1-2 finish” came about is an example in it’s self, with this client we considered a number of options, the tale is recorded in the main text linked here, enjoy. (by the way, the original drawing that accompanied this painting is offered for sale in the main text, yours for £130.00).